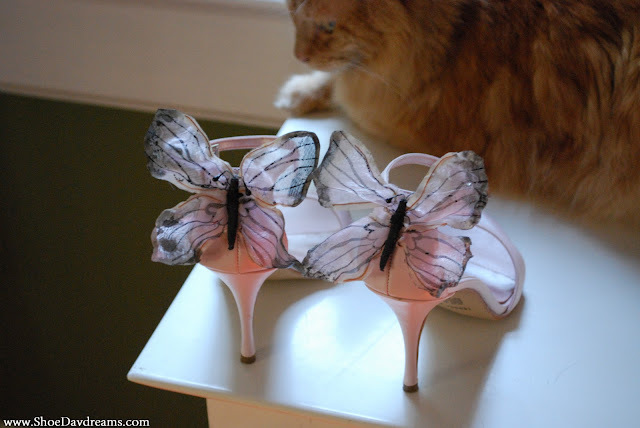 I have these lovely pair of blush pink sandals with ethereal butteflies. And I love them. 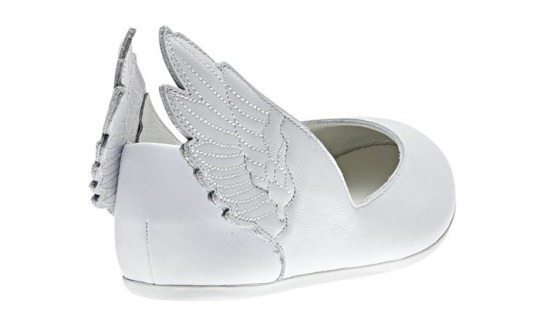 But this new pair of wing-bedecked Sophia Grace peep-toes speak to me with their dark glamour. I've always been more about the matching than the mixing. It just doesn't come naturally to me to mix patters even though I'm trying to learn. Luckily I've advanced far from my younger days of overly matched accessories. So when I see "themed" shoes I know better than to over do it. To tell you how bad it was, in high school I had a hot pink shirt with black polka dots. I also had heart shaped earrings that were also hot pink with black polka dots. Umm hmm.... 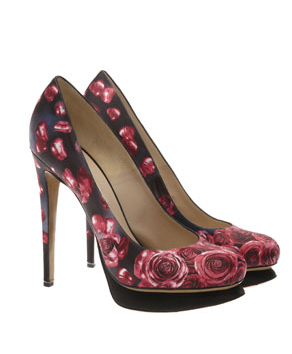 I probably would have worn these Kirkwood shoes with an equally rose-bedecked outfit (from Browns £475.00). But that's not the worst of it. One of my most notorious (and shamefully recalled) outfits was where I wore a white button down shirt with fruit painted on it, over a hot pink tank top and bright bright yellow pants. This was accessorized with a bangle in the same colors and plastic fruit dangly earrings. It was the 80s but dear lord! No wonder I didn't date much. If these Charlotte Olympia heels were around (and not $1696.20!!!) I would probably have worn them at the time too. Seriously, I had a problem. I think the theme here is "No". 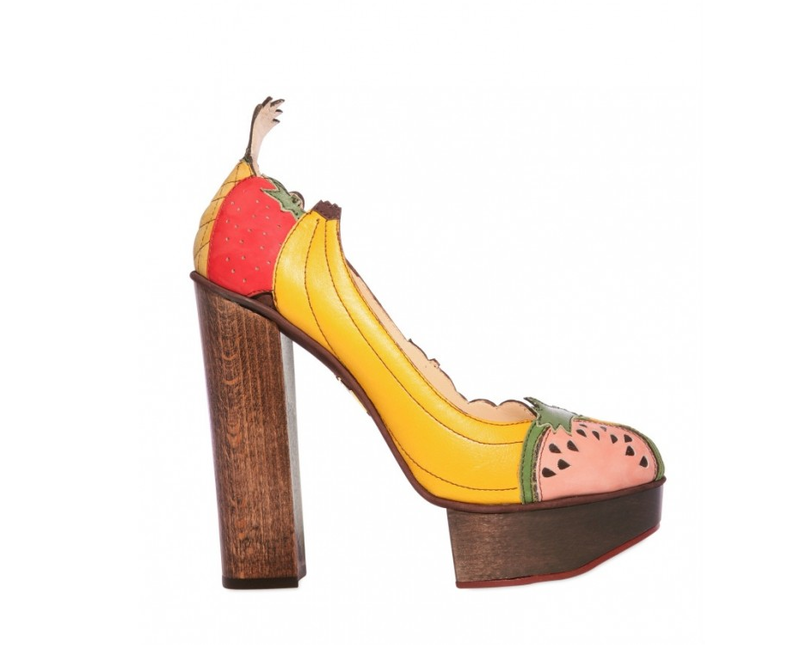 Disclosure - I kind of want those Charlotte Olympia fruit heels. Old habits die hard. I've always been a bit smitten of the Adidas x Jeremy Scott winged sneakers but they felt a bit too hip hop for me. I think they look great with skinny jeans but just aren't my style. 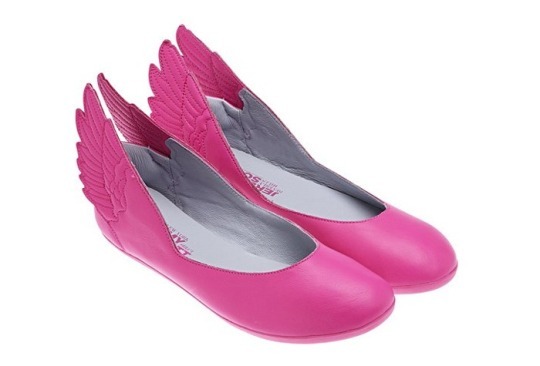 But now the pairing has come up with adorable winged flats and these are perfect. 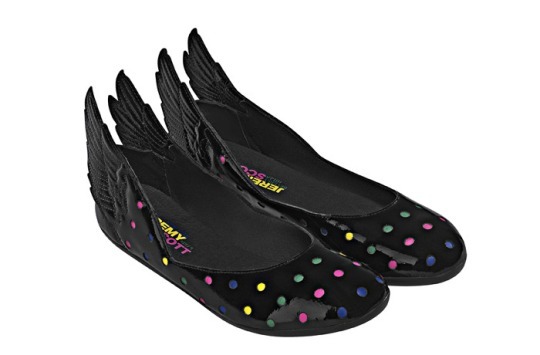 How can you not like the combo of wings, polka dots and pops of color. Of course I like the original white version the best. I can get up to mischief while looking angelic. So this past week was kind of ridiculous. Between a new business pitch keeping me at work until 8pm, the typical taking care of our gazillion animals, a new obsession and my car basically dying as I was trying to deliver the new business pitch materials causing me to freak out and have to expend tons of money, I've had a crummy week. But this weekend has been quiet and rainy, which I am very grateful for. I at least got the opportunity to paint my nails. My nails are generally craptastic so I've been trying to take care of them and they are actually improving to a point where I like trying new polishes on them. This week I'm using Essies Pop Art Pink with Orly's VIP pink glitter tips. 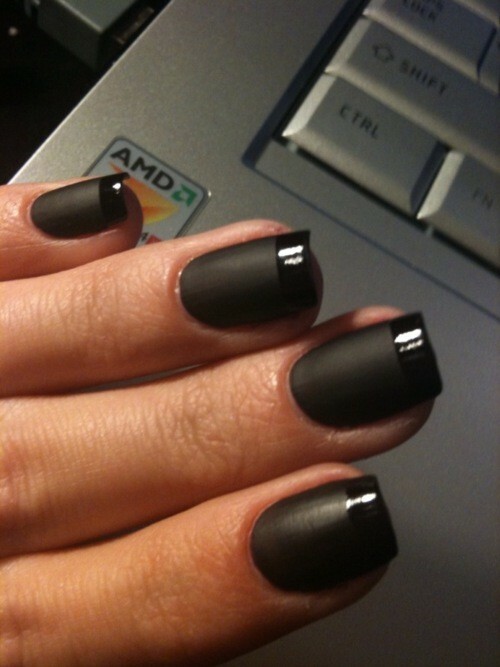 I love the matte with the shiny tip. I think I'm going to get some matte and shiny black right now. I also want to do shiny red with matte red tips. Very tonal. I'll probably need to get this done at a salon. I can just imagine how horrible this would turn out if I did this myself! 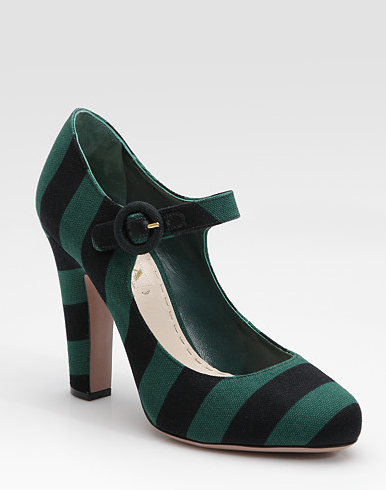 If I say "Prada" three times, will they magically come to me a la their Beetlejuice inspiration??? 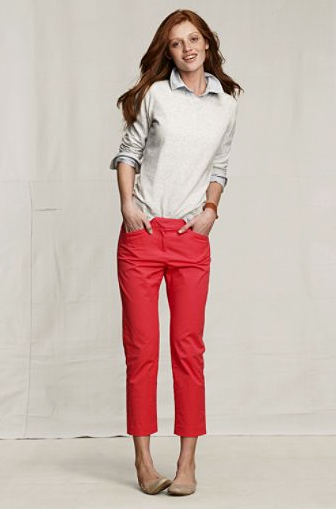 Red pants are all the rage for Summer. And I'm smitten. Even though I don't like wearing pants generally, I'm looking around for a cropped pair for me. I saw this pair of peg-leg pants from TopShop for $75. Good color but I'm not sure of the peg-leg style. 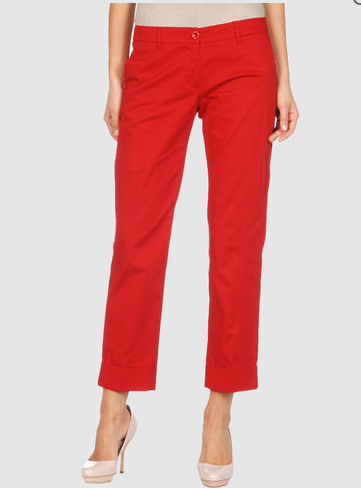 I like this cropped pair from Zara ($60) but they don't have a store in NC and they don't ship. Booo to them! These Moshinos are my back-up pair. If the ones I'm getting fall through, I'm coming back to these. They look like they would be the perfect style for me but are pricey so they don't get to be option 1. $128 at YOOX. 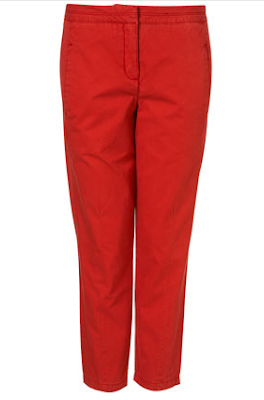 The watermelon slim leg cropped chinos from Lands' End Canvas are the ones I'm getting. They're only $39 so I'm going to try them in 3 colors - khaki and white plus the watermelon sorbet. The first order I placed got screwed up somehow and shipped back so I'm trying again. They better not mess this up twice! 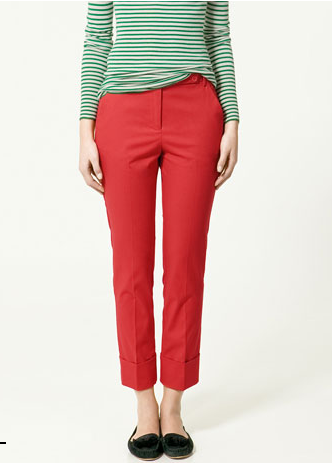 I hope they fit because I can't wait to wear bright pants with my stripe-y tops! I was clicking through my favorite store site, Bergdorfs, and came upon this Akris outfit. But it wasn't the unusal jacket/skirt/pants combo that stopped me. It was the crazy shoes. Don't these look terribly akward and uncomfortable with their forced downward slope? I just can't fathom them. Why????? 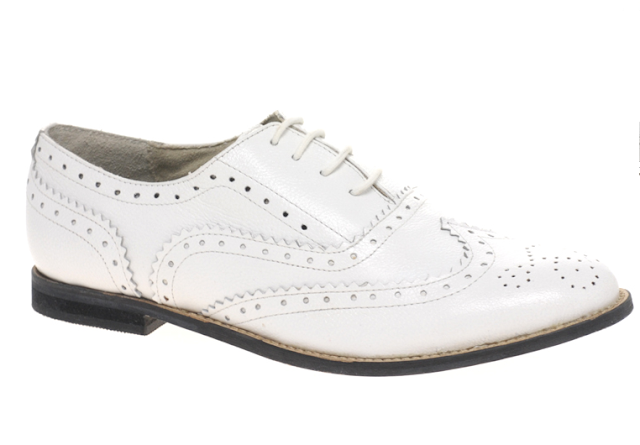 Thanks to some of my lovely readers, I've been actually able to track down my dream white oxfords. But now I face another dilemma... do I get them? 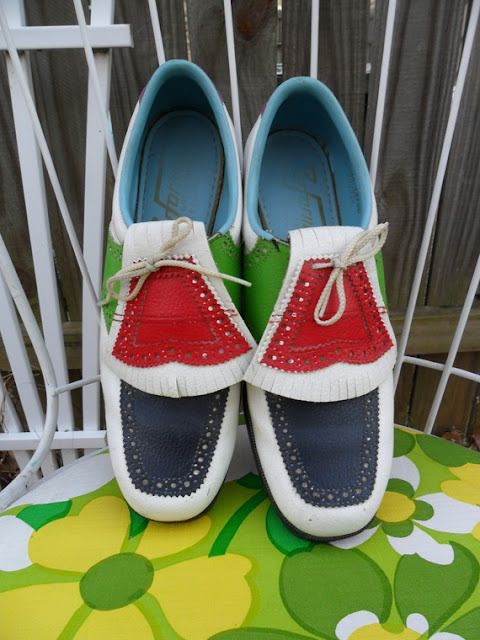 I can get these very shoes but they are 496GPB (approx $740) with the commando soles. I could get them with flat soles for 305GPB (approx $450). Pricey. Which I knew they would be. So should I be more frugal? I did order the Steve Madden Milites but they ran very very small. So I sent them back. I could order up and have a frugal option. Today I got an email about these Robert Clergerie trompe l'oeil Jili wingtips which are interesting but still not cheap at $495 at Barneys. 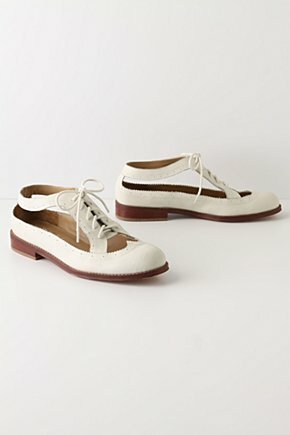 My newest, and least expensive, option are these Markey oxfords from ASOS. They're only $63 have a good look but a dark sole. So, more options. What do you think? I like what you've done here, Mr. Louboutin. Pretty clever. 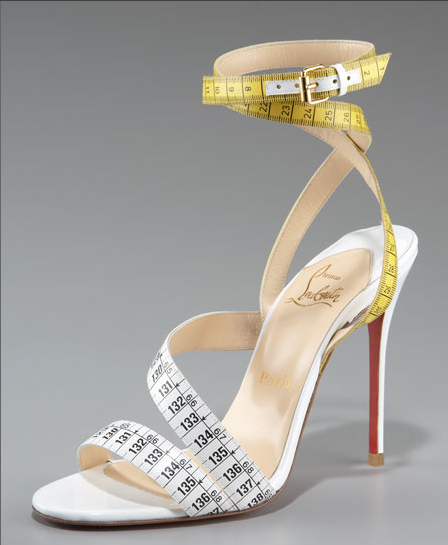 Most women don't mind having a measuring tape near their feet. Our office has become a plague zone. Right now we have more than half our staff out, including me. I'll get back to here soon. I hope. I love a good mary jane and these cuties from B. Makowsky (Mike Wazowski?) 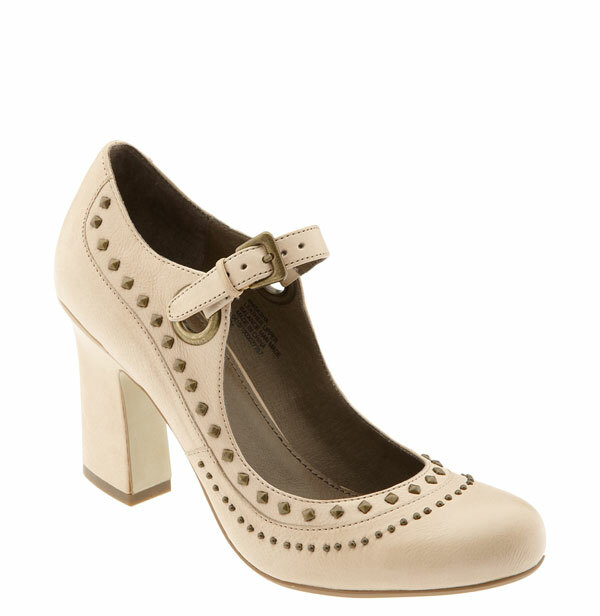 are adorable with just the right bit of sass from the low-profile studs. Pros: More outfit posts. Cons: iPhone photo at night in full length mirror. Let's just call this "arty", shall we? You can sort of see the important stuff - vintage faux leopard jacket from Shrimpton Couture, Rosalind Keep Trompe L'Oeil trench dress, leggings from Sock Dreams and Gap cap-toe ballet flats. The plexi and pearls bracelet is from Etsy. This is shown as a dress but even at 5'3" there is no way I'd wear this to work without leggings. Yikes! All mobile pics, all the time around here. That's quality! lThere is no reason for me to like this but I'm kind of intrigued by the Jeffrey Campbell Skate booties. I'm a Florida girl. I have no fond ice skating recollections. So I'm not sure why, but I think they are cool (pun intended)! 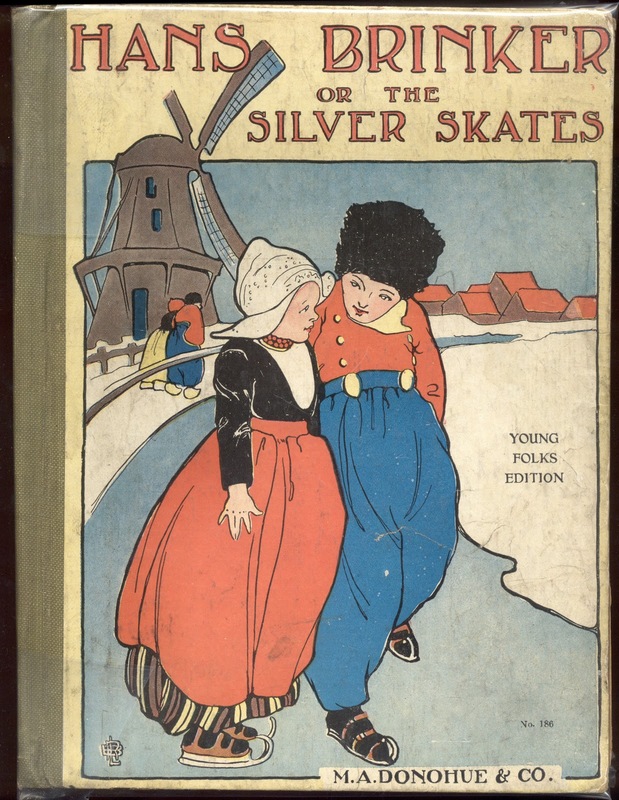 Hans and Gretel Brinker have a much nicer story to aspire to. I was going to say I like famous Norwegian Sonja Henie but then I read some more of her history and backed away from that asap. I mean, Yikes! She was a pretty, talented and successful woman who seems to have had a much darker past - from drinking issues to Nazi ties - than I would have ever imagined. Guess those white skates weren't so pristine. Even though the days are still cool, the bright skies feel like Spring. It doesn't feel right to wear dark tones. It's time for color! I started with the shoes and worked from there. 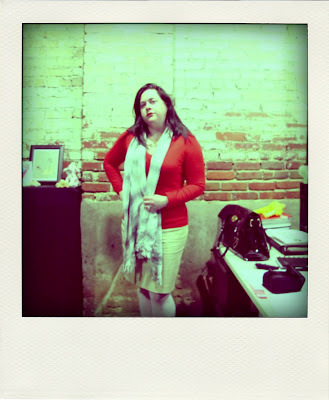 I paired a tomato red Gap sweater, with a khaki pencil skirt and grey and white Nautica scarf. I love this butterfly pin. It was my grandmother's and is very intricate with movable wings. I thought wearing it as a pin would be a nice tie back to my shoe details. I just got these gorgeous crochet tights from Sock Dreams. They're so beautiful. 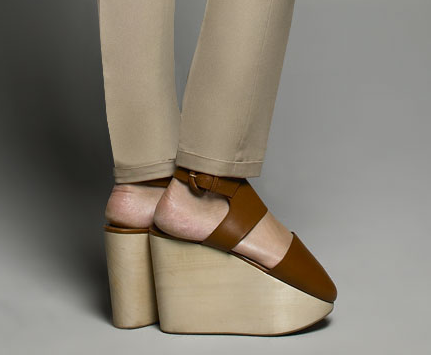 I plan on wearing them with an airy white dress and oxfords this summer. But, yep, it was all about the shoes! I just received three (!!!) 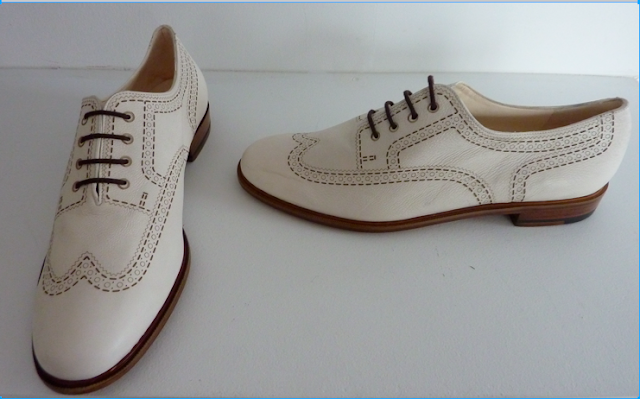 pairs of custom Hetty Rose shoes and these are the first to be unveiled. I'm going to do some more romance shots but I couldn't wait to share! I'm smitten by so many of her fabrics. It's hard to choose just one. I love the butterflies, outlined in metallic ink with large embroidered butterflies in silver thread. This design is the Amalie, which is my favorite shape. A perfect round-toe pump paired with glorious fabrics. How can you resist? 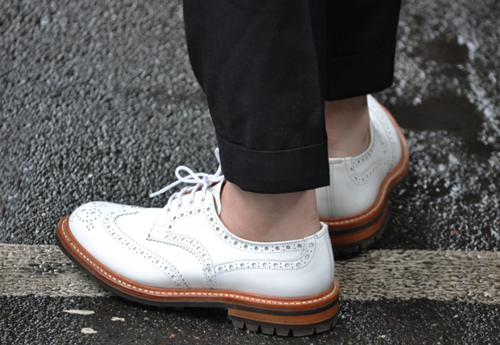 These shoes are making me (almost) wish I wore a size 9! They're golf shoes but you could take off the cleats and be good to go.